Tally can’t wait to turn sixteen and become pretty. Sixteen is the magic number that brings a transformation from repellent Ugly into a stunningly attractive Pretty, and catapults you into a high-tech paradise where your only job is to have a really great time. In just a few weeks, Tally will be there. But Tally’s new friend, Shay, isn’t sure she wants to be Pretty. She’d rather risk life on the outside. When Shay runs away, Tally learns about a whole new side of the Pretty world – and it isn’t very pretty. The authorities offer Tally the worst choice she can imagine: find her friend and turn her in, or never turn Pretty at all. The choice Tally makes changes her world forever. While the publisher has actually labelled these reprints’ covers with ‘Before The Hunger Games, there was…’, I actually found this older dystopian series reminded me more of Divergent with a bit of The Host spliced in. It was interesting reading it eight years after publication, knowing it came before the mega-series that exploded the genre. Uglies for me, though, didn’t feel quite as high stakes. It was getting there, and I think the second book will probably hit the mark, but starting the series, it seemed to focus more on the survival/relationship side of it than the political issues driving the Pretty initiative. The first third of the book felt like one long introduction. It was basically just the lead up to the blurb. Sure, I enjoyed how detailed the world building was, full of technological advances that seemed both cool and creepy. Hoverboards—while not particularly creepy—were mentioned SO often. I swear they appeared in every single chapter, at least it felt like it. And I really liked that the main character, Tally, was just a girl, the youngest of her friends, left behind in Uglyville waiting for her sixteenth birthday to become pretty and join her best guy-friend in New Pretty Town. But that wasn’t the point. If you’re going to give away the world-breaker in the blurb, don’t take over a hundred pages to get to it. Most of that time was spent introducing Tally to another Ugly girl, Shay. Not wanting the surgery to become Pretty, Shay could easily have slotted into the main character spot, leading some rebellion against the people in charge. I liked the book for not doing that. It was much more enjoyable to see things from Tally’s perspective, watching as she learned truths about the world she had always expected to join, and more importantly, had wanted to. This gave her character a chance to grow throughout the story, her perceptions of things chipped away as she discovered what lay outside of her predetermined world. I wasn’t very fazed with the romance that came into it later in the book. There was no real connection between Tally and the guy—it was basically, ‘You understand things more than anyone else so therefore you’re the one for me.’ Nothing to swoon over. They worked well as friends though—something I’d like to see in a book, a guy and a girl that don’t have to be in a relationship for no other reason than to be in one. Forgiving Uglies its romantic detour, the final third of the book was actually quite addictive. A semi-survival book, there are plenty of scenes spent hoverboarding down abandoned train tracks and over rivers out in the scrub, but where it struck me best was in the city, in the heart of the surgical mess enacted by those in power. Tally’s inner turmoil coupled with the fight she unwittingly walked into made this book quite an interesting starter, one I’m hoping improves on its second outing. Those who like the idea of hoverboarding. And those interesting in checking out old school dystopian. The only book I’ve read from Scott Westerfeld would be the Midnighters series. That too started slow but as you keep reading it picks up. I believe that’s a common thing will all his books… from the reviews I’ve read at least. Midnighters are the only books I’ve read from him. 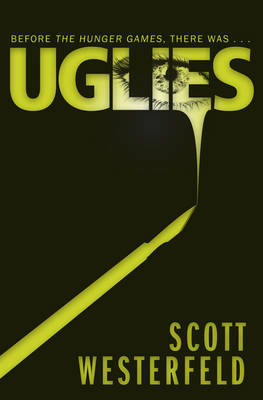 Uglies was always on my TBR list. I read the Midnighters series back in 2011 and really got into it. It has been a while, but I feel like I enjoyed it more than I am with this series (I’m recalling giant spiders), or at least with Pretties. I’m finding the start of it harder to get into than Uglies. I’m going to push ahead though and hope it picks back up.